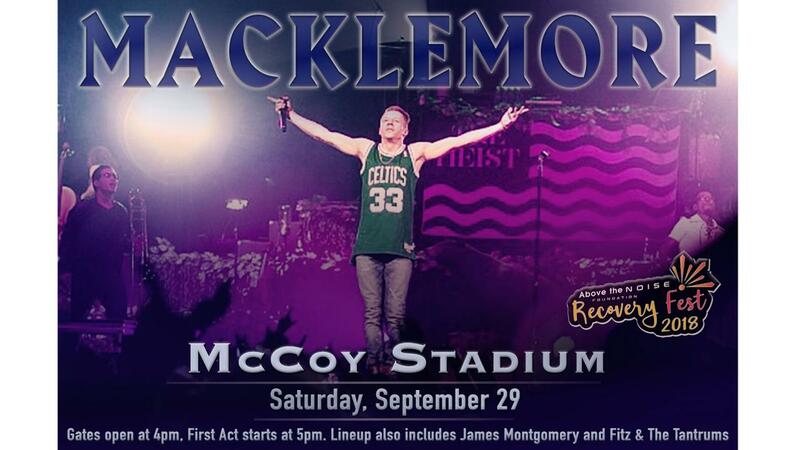 The Pawtucket Red Sox, in conjunction with Above the Noise Foundation, are pleased to announce that Macklemore will perform at McCoy Stadium on Saturday, September 29. Gates will open at 4:00 pm and show time is at 5:00 pm. Multi-platinum artists Fitz and the Tantrums, along with local rock band PVRIS, and legendary blues artist James Montgomery, will be among the opening acts. Tickets for the show are on sale now at the PawSox Box Office at McCoy, on-line at www.pawsox.com, or over the phone by calling (401) 724-7300. Tickets start at just $59. General admission tickets are priced at $59 apiece while reserved green seats are $85. Tickets to stand on the field are $150 while VIP tickets near the stage in a pit area are priced at $250. VIP and Sponsorship packages with opportunities to meet the performers, tent VIP access catered dining, and more are also available. There is no PawSox game at McCoy on September 29 and no beer, wine, or other alcohol will be sold anywhere on the premises. The Above the Noise Foundation is a New England based not for profit organization that hosts drug-and-alcohol-free music festivals that inspire, empower, and provide funding to U.S. cities battling the national addiction epidemic. This inaugural "Recovery Fest 2018" features national recording star Macklemore appearing at McCoy Stadium in Pawtucket, Rhode Island. The show will also feature several well-known musical acts including Fitz and the Tantrums, as well as local band PVRIS, local blues artist James Montgomery, and more. "It's an honor to partner with an organization that is making such a wonderful statement through the power of music," said PawSox President Dr. Charles Steinberg. "Like baseball, music unites us, and we are pleased to be able to use our ballpark to bring together so many people from so many walks of life who share a desire to improve our community, and share a desire to enjoy the performance of Macklemore." Proceeds from the event will go towards the Above the Noise Foundation, which provides funding to regional grassroots organizations working to address the addiction crisis in their community. More than 75 New England and Tri-state Area based non-profits will benefit from the concert including: Anchor Recovery Community Centers, R.E.S.T. and Push Hope in Rhode Island, Magnolia New Beginnings, Namastay Sober, and South Shore Peer Recovery in Massachusetts, SOS Recovery Center in New Hampshire, Tri Circle Inc. in Connecticut, and New Jersey Recovery Advocates in New Jersey. "Nearly every person I know has been touched in some way by the opioid epidemic in America," said Kristen Williams-Haseotes, President and Founder, Above the Noise Foundation. "Recovery Fest 2018 will allow those in recovery, their families, and those supporting them to stand together and celebrate recovery through the healing power of music." GEMINI, Macklemore's first solo effort in 12 years, was released in September of 2017. It debuted at #2 on the Billboard Top 200 chart and #1 on the charts for Rap, R&B/Hip-Hop, and Independent Albums. The album includes singles "Glorious" (featuring Skylar Grey), "Marmalade" (featuring Lil Yachty) and "Good Old Days" (featuring Kesha).